South Austin is what locals like to call a "taste of old Austin." Quaint houses, old-school boutiques, iconic restaurants and new eateries by some of the city&apos;s top up-and-coming chefs populate this lively nook. Head here to get away from the crowds and decompress in Austin&apos;s largest city park. Radio Coffee & Beer. Credit Regan Hackleman. 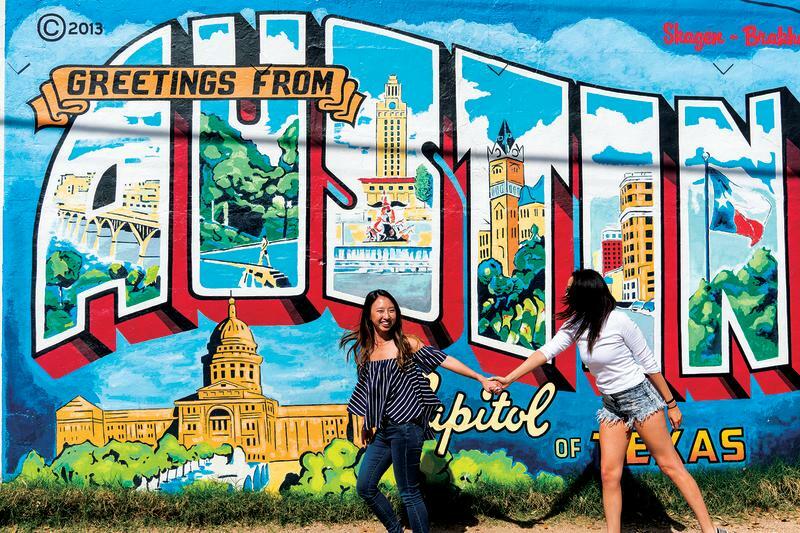 Start your day with an iced turbo coffee from Jo’s Coffee and a selfie snapped in front of the famous I love you so much mural on South Congress Avenue. Or, head to Radio Coffee & Beer to sip on craft coffee (or a vacation breakfast beer!) and nosh on an award-winning taco from Veracruz All Natural on the expansive patio. Take in the relaxed atmosphere, musicians, patio seating and generous portions of Cajun food at the iconic Evangeline Cafe. Sway: Venture into the exotic at this modern eatery spicing up Thai with a twist. Odd Duck: Sit down to New American eats from James Beard-winning Chef Bryce Gilmore. Hecho en Mexico: Taste Mexico&apos;s distinctive geographical flavors with family favorites that include genuine moles, tender marinated pork, organic chicken and beef, and chiles rellenos. Save room for the traditional Oxaca-style tres leches cake. Dolce Neve Gelato: Authentic gelato is served in an adorable bungalow. Aviary Wine & Kitchen: Aviary has been a cult favorite for wine lovers and locals since its days as decor shop/wine bar. Recently revamped as the full-service restaurant, Aviary’s warm approach to hospitality and signature sense of humor still shines. Valentina’s Tex-Mex BBQ: Two Austin staples in one, Valentina’s offers a simple but unique menu that does not disappoint, with your choice of Tex barbecue and tasty Mex fare. Courtesy of the Infinite Monkey Theorem. On South Lamar, enjoy the big sounds of Motown at The Highball with Matchmaker on Mondays, take a two-step lesson at Broken Spoke on Tuesdays, and settle down for some sweet tunes at Saxon Pub any evening. Further South, sip fresh seasonal cocktails among funky chandeliers, taxidermy and Americana decor seven days a week at Indian Roller Boutique Roadhouse. 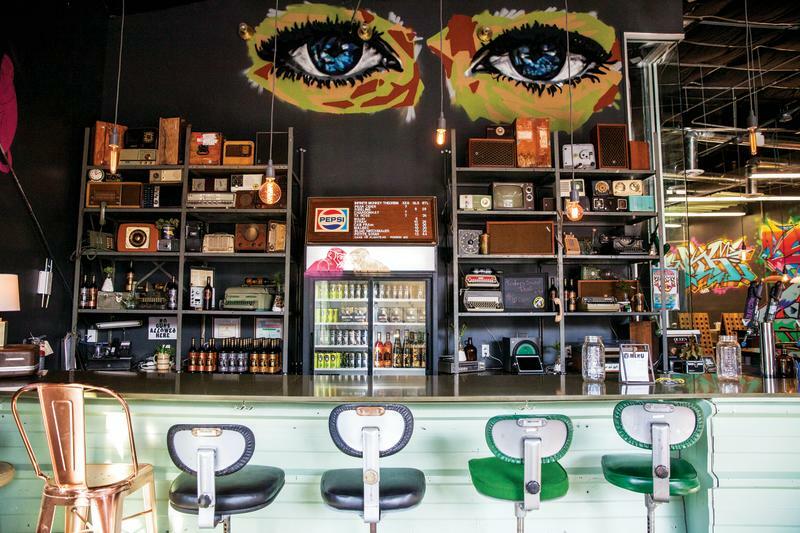 Or, venture down South Congress Avenue to find Infinite Monkey Theorem, a funky winery featuring canned wine, crosswords and some legit barbecue from neighboring pit masters LeRoy & Lewis. Stouthaus Coffee Pub: It&apos;s all about direct trade, locally roasted coffee, handcrafted ales and local artists at this Austin extended living room. 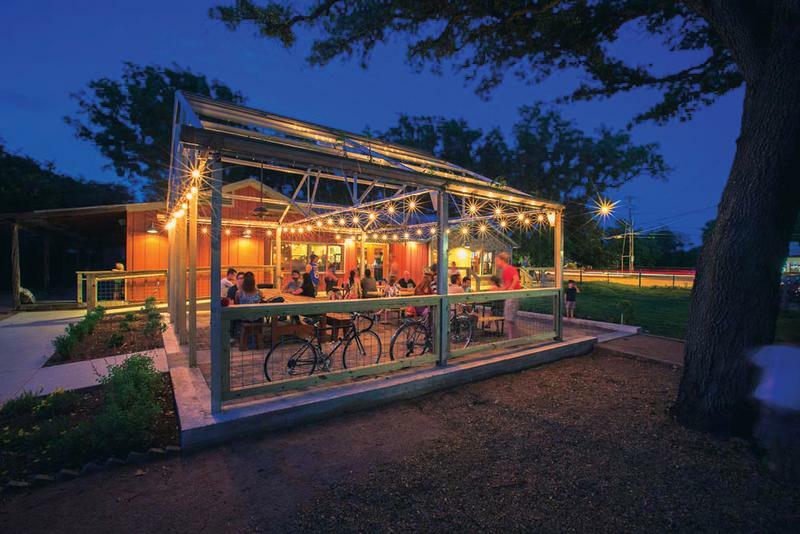 Moontower Saloon: Bring your dog and kick back at this little neighborhood bar for movies on the lawn, trivia nights, music, volleyball, delicious pizza and Triple Wide handmade Way South Austin comfort food. 400 Rabbits Bar: Indulge in special tequila and mescal-based cocktails at this lounge boasting a robust cocktail list and agave flights. The Austin Beer Garden Brewery Co.: Come see what&apos;s on tap at this Austin beer-lover&apos;s haven. Cheese boards, salads, pizza and gourmet sammies - think avocado, blueberries and goat brie on sourdough with coleslaw keep munchies at bay. Greetings from Austin mural at Roadhouse Relics. Courtesy of Jane Ko. Discover the local fashion inside shops and boutiques lining the streets of South Austin. Find some of the best vintage in town on South First Street, where you can shop authentic women&apos;s clothing, jewelry and accessories from the 1920 through the 1980s at Bloomers and Frocks. Or, get a pair of fair trade bohemian boots that are handmade in Peru but based in Austin from Fortress of Inca. Roadhouse Relics and Greetings Mural: This vintage-style neon gallery and home of the “Greetings from Austin” mural is a two-for-one tourist stop. Austin Art Garage: If you’re on the hunt for an Austin piece, this gallery is all local. Parts & Labour: offers a well-curated selection of locally made art, apparel and jewelry on swank South Congress Avenue. Uncommon Objects: Visit the new home for this quirky shop which sells antiques, vintage items and obscure objects galore. Insider Tip: Visit on the last Sunday of the month for the Uncommon Flea, when the backyard is transformed into a marketplace for all things vintage. Courtesy of the Lady Bird Johnson Wildflower Center. Just south of Lady Bird Lake, you&apos;ll find cultural institutions alongside some of the city&apos;s best outdoor offerings. Rent a kayak and spend an afternoon on the water, or enjoy Zilker Park, home to natural spring-fed Barton Springs Pool, Umlauf Sculpture Garden, Zilker Botanical Garden and more. ZACH Theatre & Long Center for the Performing Arts: Check the calendars for these thriving theaters for concerts, musicals, original works and dance, especially the Ballet Austin and summer Austin Symphony Orchestra picnics. 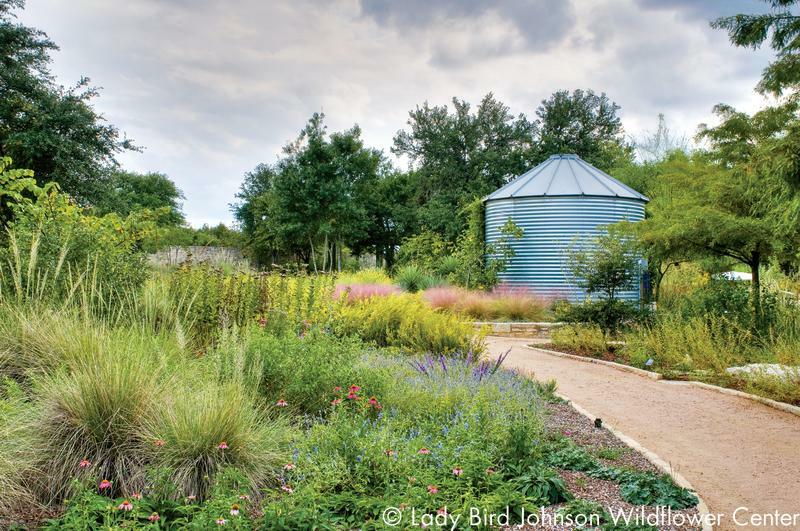 Lady Bird Johnson Wildflower Center: Stroll the beautiful gardens and trails lined by wildflowers and native Texas plants. Get lost in the family garden, bird watch and explore stunning architecture. Peter Pan Mini Golf: Pick up a putter and go a few rounds at this quirky BYOB putt-putt course. The Institution Theater: Catch high-energy live improv and sketch comedy shows every weekend. Audience participation is encouraged as the hilarious crew invents musicals, games and scenes on the spot.